A Gated Golf Community For Elegant Living With Spacious Lots! 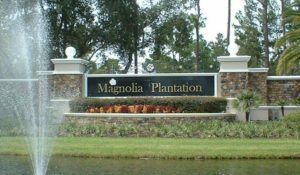 Located just off Markham Woods Road and Lake Mary Blvd, Magnolia Plantation is a beautiful community that offers a variety of comfortable homes that are convenient to the heart of the Heathrow Commerce District. It is also home to the Magnolia Golf Course, one of Central Florida’s most challenging golf courses. This gated, master planned community includes 498 homes, built from 1999 to current. Home types are high-end builder models to luxury custom on oversized lots, most with either golf, water or conservation views. The area features Florida nature at its best, with a Wekiva River landscape filled with lots of wildlife and natural beauty. Magnolia Plantation residents enjoy a community park and tennis courts for outdoor family fun. Average prices range from high $300’s to well over $1 million. For more information visit Magnolia Plantation website.